This story marks the second of six blog stories spotlighting New Jersey’s shark species. Just as the largest whales are filter feeders, so are the two largest fish in the world. The basking shark, the second largest fish in the world after the whale shark, grows to a length of up to 33 feet long but feeds on organisms smaller than your fingernail. It swims through the ocean with its mouth open while tons of sea water and the small organisms with in it, enter the mouth and get filtered by the shark’s enormous gills. If you’ve used a pool net to skim leaves and insects off the top of a swimming pool, you have an idea of how the basking shark feeds. A basking shark feeding. Photo courtesy of Flickr user jidanchaomian. 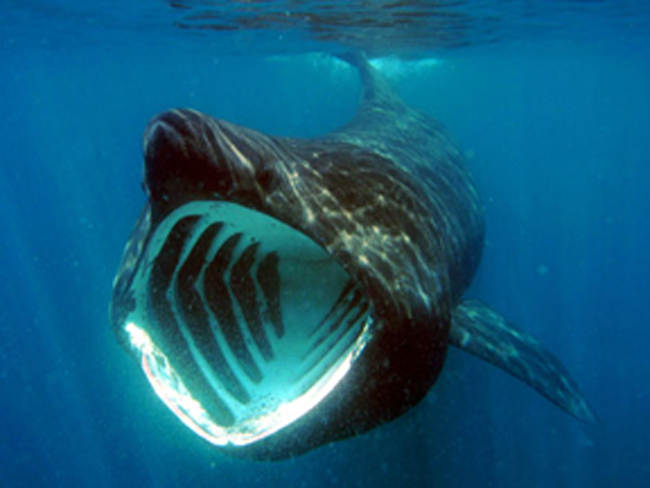 Despite their enormous size, basking sharks are harmless to humans. Unfortunately, like many shark species, they are a species in decline. Basking sharks have been hunted as a source of food, fins, and liver oil for many years. They reproduce slowly, so if they are to recover, they will require protection throughout their range for many years. To learn more about this shark species which occurs in New Jersey waters, visit our Field Guide page. This entry was posted on Monday, June 27th, 2016 at 7:04 am	and is filed under Fish, Marine. You can follow any responses to this entry through the RSS 2.0 feed. Both comments and pings are currently closed.